We had some friends round for a delicious Sunday roast dinner. It took me almost 6 hours to make, but it was so nice to have people round for weekend food. Heat the oven to gas mark 3 / 160C. Wipe the meat and season. 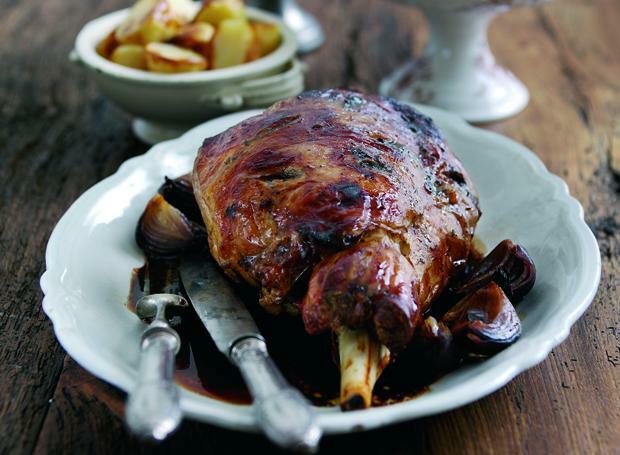 Put 3tbsp of Olive Oil into a frying pan and seal the lamb, cooking for 8mins and turning throughout. Remove the lamb and set aside. On the hob in a heavy casserole dish (suitable for hob and oven) fry the onions in the olive oil/juices from the lamb, add a few sprigs of thyme and season well. Cook until softened. Sit the lamb on top of the onion mix and pour the wine over the top. Cover the pan and cook for 4-5hrs, until the meat begins to fall apart. Remove from the oven and stand for 30mins. Remove the lamb from the pot and cover with foil to rest. You can reduce the leftover lamb/wine jucies to make gravy, I simmered it on the hob for about 20mins, stirring occasionally, until thickened. It was a wonderful combination of entirely home-made Sunday roast goodies! Gallery | This entry was posted in Recipes / Food and tagged Dinner, Food, Lamb, leg, leg lamb, Recipe, Roast, slow roast, sunday. Bookmark the permalink. This recipe is great and your photo/presentation is lovely! Thanks – it’s a delicious roast meat. I borrowed the photo from simplybeefandlamb.co.uk, that’s why there’s a caption under it, some of the photos on my blog are mine, but if I forget I add in one that represents my dish until I cook it again and remember to photograph it! Amazing! I wondered what that was. SInce I own almost no dishes I should look into doing that too! It is helpful, I’m quite forgetful when it comes to taking photos of my food, especially when I’m hungry to eat what I’ve just spent ages cooking!! It was the roast to beat all roasts! It is a mouthwatering recipe! He he! I must try adding chocolate next time, thanks!